Heat oven to 375°F. Grease 24 regular-size muffin cups with shortening; lightly flour. In large bowl, mix Cookie Base ingredients with spoon until soft dough forms. Using rounded tablespoonfuls of dough, shape dough into 1 1/4 to 1 1/2-inch balls; place in muffin cups. With thumb, make indentation in centre of each. Bake 10 minutes. Meanwhile, in medium bowl, mix Pecan Pie Filling ingredients until well blended. 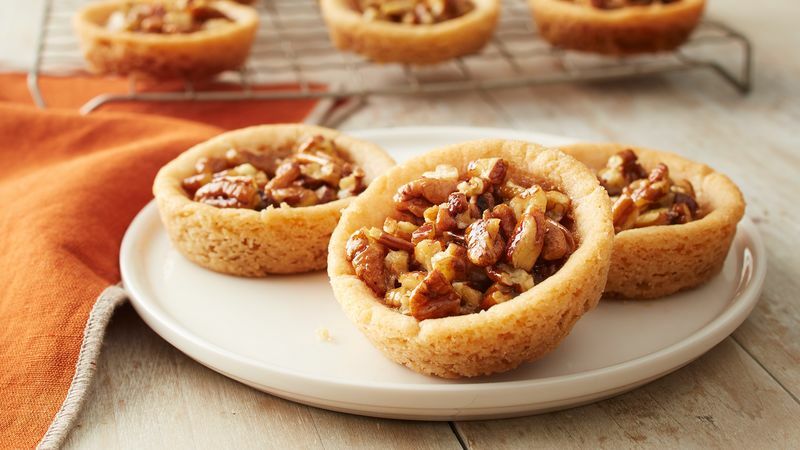 With end of wooden spoon, reshape indentations in centre of each cookie to create 1 1/2-inch opening in partially baked cookie cups. Clean off end of wooden spoon with paper towel as needed. Stir filling to redistribute nuts; spoon 1 tablespoon filling into each cookie cup, stirring before filling each. Bake 8 to 10 minutes or until edges are golden brown. Cool 10 minutes in pan on cooling rack. Run knife around edge of each cookie cup to loosen. Cool completely in pan, about 30 minutes. If you don’t have enough muffin pans, cover and refrigerate filling and cookie dough until placed in muffin pan. You can shape balls of dough ahead; cover with plastic wrap to prevent dough from drying out.